Tomorrow is Red Nose Day here in the UK. But don't be fooled by the name into thinking this annual fundraising event is just a single day. For weeks now celebrities have been taking part in challenges like rafting the length of the Zambezi or doing 25-hour comedy gigs. One Direction have released a charity single. Red noses are being sold in shops and online; this year they're called Dinosesaurs and there are three different ones to collect. And we're all being encouraged to get involved and 'do something funny for money'. Comic Relief, the charity behind Red Nose Day, have been doing fantastic work - and keeping us all entertained - for 25 years, and I have nothing but respect for anyone who raises money for charity. I recently sponsored several of my colleagues who ran a half marathon, and bought tickets for a charity raffle last year, despite literally never having won a raffle prize in my life (including the time when every single member of my family won something except me - this was 20 years ago but it still hurts). Firstly, choose a charity that means something to you. That way you'll be able to speak passionately about it to people and explain to them how their money can make a difference. You may find that your charity has a special significance for them too, and they have their own story to share. If that's the case, be prepared to listen. It shows you're interested in the cause, and you're not just after their money. Set yourself a target; be ambitious but realistic. Show your appreciation for any donation, no matter how much it is - it all takes you closer to your goal, and even a small donation may be a lot of money to the person giving it. Offer incentives; a colleague recently promised to run 10k barefoot (literally) if he raised a certain amount in sponsorship. Bleeding feet aren't exactly an incentive - but you get the idea. You could offer something a bit more tempting, like free chocolate for anyone who helps get you over your target amount, for example. Know when to take no for an answer. A lot of people already donate money to other charities on a regular basis so they have a rule against any additional giving. Others may just not want to sponsor you, and that's their decision - it is their money, after all, and finances are tight for many people at the moment. If you're face to face with someone, observe their body language and know when to back off. And of course, you need to spread the word. Start with your friends, family and work colleagues, or anyone who you think is likely to donate a decent amount, as it's easier to keep fundraising if you're off to a good start. Then you can start going further: use your social networks like Facebook and Twitter, mention it in forums or online communities, ask your family and friends to tell their friends, put up posters or hand out flyers, add it to your email signature. And there's no harm tweeting your favourite celebrities to see if they'll pass on your request - it might get you a few more pounds! 300 poisonous spiders?! Mental, clearly mental! Lol. And the same dress for a year? Did she have two of the same dress so she could wash one while wearing the other? Just seems a smelly task lol. I for one cannot stand high street charity collectors. They constantly try and stop you and once a man said 'don't worry I am not asking for money today' and then at the end of his speech wanted money (bearing in mind I was a student then so already in my overdraft!). I think she actually had seven identical dresses but the real challenge was how to accessorise and make it look like a different outfit every day. I thought the same as you to begin with though! High street charity collectors seem pretty unpopular with a lot of people! I have a bit of sympathy for them because I think they're under pressure to get a certain amount of donations each day, but I agree some of their tactics aren't great. I once got trapped with a guy when I was waiting for friends at Covent Garden tube; when I refused to give him any money he tried to guilt trip me, along the lines of 'Don't you care about the planet?'. Funnily enough, I was unimpressed and still didn't give him any money! 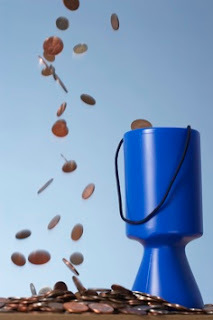 I guess it is easy to forget that everyone has targets to hit these days, including high street charity collectors! Yes that's true - it's easy to put a few coins in a bucket but signing up for a monthly donation is a big decision to make on the spur of the moment. I guess they're hoping to catch people off guard? It must have a certain success rate or they wouldn't keep doing it. I met someone a while ago who used to do cold calling for a charity and apparently they were told that the person they were speaking to had to say no three times before they could give in and end the call!